This Christmas, take a selfie with these chic red polar bears! 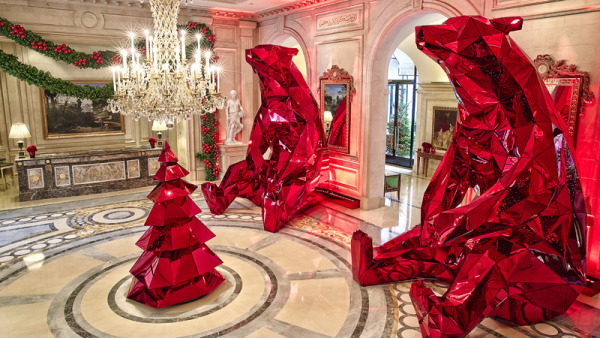 As Christmas approaches and traditional decorations begin, Jeff Leatham has unveiled stunning larger than life polar bears at Four Seasons Hotel George V, Paris. Designed by Leatham and produced by Michael Amann, these sculptures are entirely made from red glass. Artistic Director Jeff Leatham has been regularly amazing people with his decorations at Four Seasons Hotel George V, Paris. Every week 14,000 flowers are brought in from Amsterdam and Leatham works his magic to create spectacular displays that begin at the lobby and go up all the way to the rooms. Leatham’s work has never been traditional and so far his approach has worked tremendously well, with the Hotel being renowned in Paris for its flower displays. Now, as Christmas approaches and everyone gets about decorating their trees with bobbins and stars, Leatham has created a Christmas display that will perhaps be the most unconventional yet magical display of the season. As expected there is a Christmas tree at the entrance hall of Four Seasons Hotel George V, Paris, but the show stoppers are the two massive and spectacular polar bears. Designed by Leatham and produced by Michael Amann, Director of the Crystal Group, these sculptures are made entirely of red mirrors and took 1,500 hours to build. Leatham was apparently inspired for this design by his childhood fascination with the powerful yet gentle animal. The entrance lobby of Four Seasons Hotel George V, Paris is now dazzling with the effect of the 900 red mirrors. Sitting 13 feet tall, these majestic bears will be welcoming people to the hotel till 10th January, 2015. I think seeing these bears alone and perhaps even taking a selfie with them is worth a trip to Paris. Also, considering that the Hotel has recently been declared the Best Hotel in the World for its Service, I bet you’ll go home with many more shiny happy moments and selfies! You can book your stay at Four Seasons Hotel George V, Paris, from here. And in case you would like to know what else is happening in the city of romance this Christmas, click here. Tagged LifeSpice, Society, The Good Life, Travel. Bookmark the permalink.